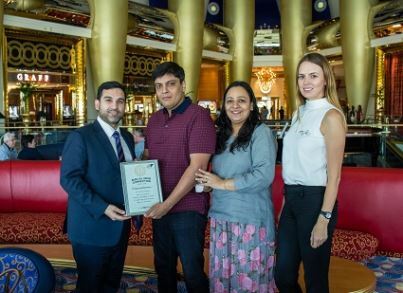 Dubai, UAE, March 2016: One lucky winner is celebrating after being awarded a weekend for two at the world’s only seven-star hotel, the Burj Al Arab, courtesy of Dubai-based property developer The First Group. In addition to two nights’ luxurious accommodation at the iconic hotel, Mr. Dhawan from India received two business class flights to Dubai and luxury airport transfers as part of The First Group’s ongoing ‘Amazing Draw’ promotion. Mr. Dhawan was automatically entered into the draw when he registered his interest in hotel investment with The First Group during an event that took place in New Delhi, India. Dubai ranks as one of the most popular international markets for Indian property investors. Indeed, Indian investors accounted for 23 percent of all Dubai property transactions involving foreigners in the first half of 2015, and a remarkable 14 percent of all transactions recorded – including those involving Emiratis and other Arab nationals. According to statistics made available by the Dubai Land Department, Indian nationals have invested over AED 20 billion in 2015, making them the largest non-Arab investors in the UAE. The First Group has an exceptional track record of developing international landmark properties spanning over 30 years. Its expert eye for emerging markets led the company’s founders to Dubai, where it became one of the first hotel and property developers to recognise the city’s lucrative property investment potential. Meticulous research and an entrepreneurial spirit led The First Group to specialise in the highly profitable world of hotel investments. It builds iconic hotels, offering individual investors the opportunity to profit from purchasing hotel rooms and suites. Through the First Group’s partnerships with the world’s leading hotel operators, it also means these properties enjoy higher occupancy levels and greater rental rates – factors that in turn spell lucrative returns for real estate investors. Home to The First Group’s global headquarters, Dubai is the main location for company’s diverse property portfolio, which also encompasses the wider United Arab Emirates. However, property investment with The First Group means more than just securing financial returns. Unlike many developers, its relationship goes beyond the handover and clients remain the cornerstone of everything the company strives for, from a project’s foundation to its continuing success over the years. Clients are invited to learn more with The First Group’s tailor-made ‘Discover Dubai Experience’. This will enable them to discover firsthand the numerous benefits of owning with The First Group.